The Ringling takes great pride in providing one of the best museum experiences in the country and visitors are taking notice. The travel website TripAdvisor recently recognized The Ringling as one of the 25 top museums in the 2014 Traveler’s Choice Awards. According to the Institute of Museum and Library Services there are more than 35,000 active museums in the United States and the TripAdvisor ranking places The Ringling in the top 0.05% of museums nationally. More than 80 percent of the 1873 reviews of The Ringling on TripAdvisor ranked the Museum as excellent. Operating in 45 countries, TripAdvisor is the world’s largest travel site, which relies on more than 170 million reviews from travelers to compile its rankings. The rankings also listed The Ringling as one of the top six art museums in the United States for visitor experience. The Art Institute of Chicago took the top spot for art museums and museums overall. The only other art museums ranked above The Ringling were the National Gallery of Art in Washington D.C., The Getty Center in Los Angeles, the Metropolitan Museum of Art and the Frick Museum in New York. High became executive director in 2011. Since then he has overseen the design and the beginning of construction of a new Center for Asian Art, the opening of “Joseph’s Coat,” a skyspace by artist James Turrell, the stabilization and expansion of the Ringling International Arts Festival and the development and implementation of a strategic plan that, among other initiatives, prioritized visitor experience. 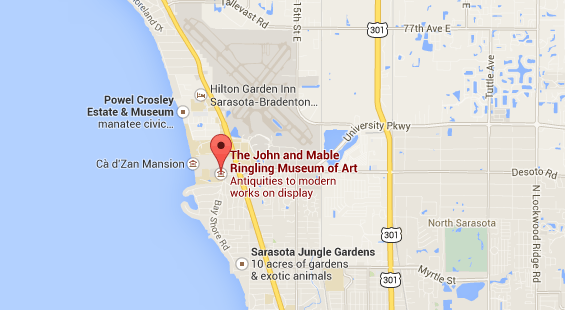 Located on 66-acres on the shores of Sarasota Bay, The Ringling is the State Art Museum of Florida. The Museum campus includes Ca’ d’Zan, the winter residence of Circus King John Ringling and his wife Mable, the Historic Asolo Theater, a restored eighteenth-century Italian theater, as well as the oldest Circus Museum in the United States and the Museum of Art. The Ringling welcomed a record of 384,323 total visitors during its 2013-14 fiscal year, which ended on June 30. The Museum of Art is known for its collection of works by Old Masters including Paolo Veronese, Diego Velasquez and Peter Paul Rubens. Rubens’ massive “Triumph of the Eucharist” series is one of the Museum’s most prominent gems. The Ringling also features a significant contemporary program of visual and performing arts in the galleries, grounds and the Historic Asolo Theater.